Supercritical fluids and in particular supercritical carbon dioxide have shown to be a viable technology for a variety of extractions. 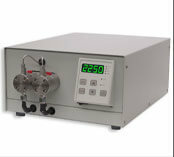 While process conditions require high pressures, technological advances have now made it feasible to acquire such equipment for the undergraduate laboratory. One novel application we are currently investigating involves supercritical fluid extraction of organic binders from metal parts produced by powder injection molding (PIM). The initial proof-of-concept studies have been undertaken in our laboratory with bench top equipment manufactured by Supercritical Fluid Technologies, Inc.
Supercritical fluid extraction was successfully used to extract peanut oil from peanuts at temperatures between 40 and 80 °C and pressures of 5000-7000 psi. Static/dynamic cycling was used with a 10 minute static soak time, followed by a 10 minute dynamic interval. The overall extraction time was held constant at 3 hours. Peanut oil yield was determined gravimetrically. The crossover phenomenon was observed with the crossover pressure occurring at 6000 psi. Above the crossover pressure, an isobaric increase in temperature has a positive effect on the extraction yield, while below the crossover pressure an increase in temperature resulted in a decrease in oil yield. Yields between static/dynamic cycling and continuous runs were comparable, suggesting CO2 usage could be reduced by half by static/dynamic cycling, creating a cost effective, greener process. Substituted phenols are an important class of compounds having widespread use (germicides, disinfectants, ingredients in fuel, etc.). In this work, the solubilities of selected substituted phenols (2,5-dimethylphenol, 2,4,6-trimethylphenol,2,3,5-trimethylphenol, 4-phenylphenol, 4-tertbutylphenol) in binary (single solute + SCF CO2) and ternary (two solutes + SCF CO2) systems were investigated using a SFT Phase Monitor. Carbon dioxide is widely recognized today as a “Green Chemistry” solvent. The unique physical and chemical properties of carbon dioxide in its supercritical state, namely the absence of surface tension, low viscosity, high diffusivity, and easily tunable solvent strength provide for utility in a variety of industrial and scientific applications. In the microelectronics fabrication industry this non-toxic, environmentally friendly solvent is being heavily investigated as an alternative agent for device cleaning, microelectromechanical systems (MEMS) drying, and lithographic processing. With the emerging advances in fabrication techniques and materials, microelectronic device features with dimensions below 100 nm are now possible to produce. Supercritical carbon dioxide extraction is currently used in several food and pharmaceutical manufacturing applications. Its “greener” nature makes it a desirable option when compared with traditional organic solvent extractions. The purpose of this work is to compare the cost of using supercritical CO2 to commercially extract peanut oil with that of the traditional hexane extraction process. Solubility values of peanut oil in supercritical CO2 were also obtained under different conditions of temperature and pressure. The purpose of this study was to test the utility of rapid expansion of supercritical solution (RESS) based cocrystallizations in inducing polymorph conversion and crystal disruption of chlorpropamide (CPD). CPD crystals were recrystallized by the RESS process utilizing supercritical carbon dioxide as the solvent. The supercritical region investigated for solute extraction ranged from 45 to 100°C and 2000 to 8000 psi. Solute extraction was made possible by utilizing a SFT-150. Substituted phenols are an important class of compounds having widespread use (germicides, disinfectants, ingredients in fuel, etc.) There is little information in the literature regarding the solubilities of phenols in SCF CO2. Accurate and precise solubility data for the compounds of interest is essential for the design of any SCF-based process. In this work, the solubilities of selected substituted phenols (2,5-dimethylphenol, 2,4,6-trimethylphenol,2,3,5-trimethylphenol, 4-phenylphenol, 4-tertbutylphenol) in binary (single solute + SCF CO2) and ternary (two solutes + SCF CO2) systems were investigated using a SFT Phase Monitor. The phase behavior of solutes in SCF is an important aspect, which is often overlooked in the solubility determinations. Solid solutes when in contact with supercritical CO2 can exhibit complex phase behavior such as depression in melting point resulting in multiple phases, and therefore can considerably influence the determination of solid solubility. The purpose of this study is to research solubilities of aromatic carboxylic acids and substituted phenols in SCF- CO2 using the SFT phase monitor. Consistent production of solid drug materials of desired particle and crystallographic morphologies under cGMP conditions is a frequent challenge to pharmaceutical researchers. The purpose of this article is therefore to provide the information and resources necessary for startup research involving particle formation using supercritical fluids. The importance of each stage of particle formation in tailoring the particle morphology is discussed in this article along with presenting various alternatives to perform these operations. Of the variety of methods used to synthesize CNTs(carbon nanotubes), metalencapsulated dendrimers represent a particularly attractive catalyst for nanotube growth. For such nanocomposite growth, our synthetic strategy has been to find a method to control the size and distribution of the catalyst seed particle, as well as to develop a low-temperature, nonreactive means of carbon production, to best preserve the structure of temperature-sensitive dendrimers. As an initial step toward this goal, we present the use of supercritical carbon dioxide as a medium for the decomposition of CCl4 using iron-encapsulated polypropyleneimine (PPI) dendrimers as a catalyst for MWNT growth. Within the last five years, there has been an explosion of research in supercritical fluids; more recent reports are now exploiting this medium for nanomaterials synthesis. An important goal for undergraduate curricula should be the constant upgrading of content to include the most leading-edge techniques. To this end, this Journal has published a few articles related to SCF technology for undergraduates. This article describes a module to introduce undergraduate inorganic chemistry students to an exciting area of nanotechnology that also incorporates SCFs, an environmentally-friendly alternative to organic solvents. Mitragyna speciosa is a narcotic plant but with specific medicinal importance. The main components of the leaves of M. speciosa are indole alkaloids. Previous scientific researches have shown that the alkaloidal extracts possess very potent anti-inflammatory, analgesic and opioid properties. The three most abundant indoles are mitragynine, paynanthine and speciogynine – the first two of which appear to be unique to this species. All these compounds were obtained from classical organic solvent (diethyl acetate, dichloromethane or methanol) extraction. In this research programme, supercritical fluid extraction (SFE) of M. speciosa was performed. An optimal condition of supercritical fluid extraction was developed using an analytical-scale SFE system. The conventional extraction methods were conducted in parallel for comparison. CO2 extract of M.speciosa has never been studied yet and CO2 was chosen as the media of extraction because it is non-toxic and environmentally safe to prepare and use. Cellulose and corn stover were subjected to a reaction with polar cosolvents (methanol and water)/CO2 at subcritical and supercritical conditions. Resulting products from a cellulose reaction at 300oC analyzed by GCMS consisted of a mixture of organic acids, sugars, and several other components. Examples of organic acids included acetic, hexanoic, heptanoic and malonic acids, whereas sugars were levoglucosan, D-Allose, and D-Galactose. Furthermore product samples from a corn stover reaction at 300°C suggested presence of ketones, aromatic hydrocarbons, and methyl esters. As evidenced by these results, reactions at high pressure are plausible although they are accompanied by a complex product composition, and an unreacted residue of cellulose and lignin. Catharantrus roseus is a well-known medicinal plant belonging to the family Apocynaceae. It is regarded as a rich source of pharmaceutically important indole alkaloids that are used as antitumor, hypotensive and antiarrhythmic agents. Among the indole alkaloids, vinblastine and vincristine are currently used to treat a wide variety of neoplasms and is recommended for treatment of Hodgkin’s disease, acute leukemia and choriocarcinoma, which is resistant to other types of therapy. The unique antitumor activities of these indole alkaloids have resulted in a great demand for vinblastine and vincristine as anticancer agents. Aluminum hydride (alane) has received a great deal of interest in recent years due its possible use as a hydrogen storage material. Alane contains 10.1 weight % hydrogen which meets the 2015 target set by the DOE of 9 weight % hydrogen. The decomposition of alane to its elements has no side reactions and has a decomposition enthalpy of 10 KJ/mol H2. Thermal decomposition begins above 60 °C, but is slow. Decomposition studies have shown an ideal temperature range of 130 – 150 °C but with added dopant of TiCl3 or LiH decomposition can be achieved at an acceptable rate at <100 °C. This, accompanied with recognition that rehydrogenation is realistic, makes alane a contender for use as an ideal hydrogen storage material. The purpose of this work was to develop an extraction technique to yield a betulinic acid-(BA) enriched extract of the traditional anti-anxiety plant Souroubea sympetala Gilg (Marcgraviaceae). Five extraction techniques were compared: supercritical carbon dioxide extraction (SCE), conventional solvent extraction with ethyl acetate (EtOAc), accelerated solvent extraction (ASE), ultrasonic assisted extraction (UAE) and soxhlet extraction (Sox). The EtOAc and SCE extraction methods resulted in BA-enriched extracts, with BA concentrations of 6.78  0.2 and 5.54  0.2 mg/g extract, respectively, as determined by HPLC-APCI-MS.The bioactivity of the BA-enriched extracts was compared in the elevated plus maze (EPM), a validated rodent anxiety behavior assay. Rats orally administered a 75 mg/kg dose of SCE extract exhibited anxiolysis as compared with vehicle controls, with a 50% increase in the percent time spent in the open arms, a 73% increase in unprotected head dips and a 42% decrease in percent time spent in the closed arms. No significant differences were observed between the SCE and EtOAc extracts for these measures, but the animals dosed with SCE extract had significantly more unprotected head dips than those dosed with the EtOAc extract. The SCE extract demonstrated a dose-response in the EPM, with a trend toward decreased anxiety at 25 mg/kg, and significant anxiolysis was only observed at 75 mg/kg dose. This study demonstrates that SCE can be used to generate a betulinic acid-enriched extract with significant anxiolysis in vivo. Further, the study provides a scientific basis for the ethnobotanical use of this traditional medicine and a promising lead for a natural health product to treat anxiety. Supercritical carbon dioxide (scCO2) was used to extract components of interest from Scenedesmus dimorphus, a microalgae species, under varied algal harvesting and extraction conditions. Liquid chromatography-mass spectrometry (LC-MS) was used to quantify the concentration of fatty acid methyl esters (FAME) and the FAME profile of transesterified lipids, phospholipids and pigments extracted under varied supercritical temperatures and pressures. The scCO2 extraction results are compared with conventional solvent extraction to evaluate differences in the efficiency and nature of the extracted materials. Algae harvested by centrifugation (vs. lyophilization) demonstrated a similar extraction efficiency in scCO2, indicating potential energy benefits by avoiding conventional algal mass dehydration prior to extraction. Centrifuged algae and optimized extraction conditions (6000 psi; 100°C) resulted in comparable FAME yields to conventional processes, as well as increased selectivity, reflected in the decreased pigment, nitrogen and phospholipid contamination of the FAME. Cell pre-treatments—sonication, microwave, bead beating and lyophilization—showed an enhancement in extraction yield in both conventional solvent and scCO2 extraction, allowing for improved extraction efficiencies. This study suggests that scCO2, a green solvent, shows great potential for algal lipid extraction for the sustainable production of biodiesel. Biodiesel was synthesized under catalyst-free supercritical methanol reactions using a variety of oils at 250 to 325°C in a 1-liter high-pressure batch reactor. Multiple experiments were performed at 6 to 80 molar ratios of methanol to oil; product samples were then analyzed by titration, and a Gas Chromatograph which monitored conversion of triglyceride by measuring total glycerine. At 300°C and 27 molar ratios, 97% conversion was attained. Following the experiment samples were placed in separatory funnel and the crude biodiesel layer was treated further to remove free glycerine by centrifugation and also with an Amberlite BD10dry which was more effective. Coprecipitation of active pharmaceutical ingredients (API) with additives can provide the ability to add functionality to API’s at early stages of drug discovery and synthesis. It is with this objective that a number of drugs were recrystallized in the presence of structurally related additives. The rapid expansion of supercritical solution (RESS) process was evaluated to recrystallize the drug–additive mixtures. Results of RESS aided coprecipitation studies involving twelve drug–additive mixtures are reported in this manuscript. Characterization of these mixtures revealed a number of interesting phenomena. These include habit modification, solubility enhancement, particle size reduction, eutectic formation, reduction in crystallinity, amorphous conversion, hydrate formation, polymorph conversion and selective extraction. In viewing each of these phenomena from an application standpoint, this manuscript serves as proof of concept for altering the physicochemical and mechanical properties of API’s using supercritical fluid (SCF) coprecipitation. It was concluded from these studies that the rapid crystallization conditions offered by the SCF media alone does not provide the ability to consistently dope crystals. Competing mechanisms based on the relative solubility of drugs and additives in SCF media, as well as the selectivity of SCF solvents are to be taken into consideration while undertaking coprecipitations. The utilization of carbon dioxide under supercritical conditions in the delignification of wood has already been reported in the literature for several species of tree. In these studies organic solvents (acetic acid, ethanol, methanol, dioxane, etc.) were used as co-solvent and very high pressures (15–25MPa) were employed. Organosolv treatments of various woods have also been reported and have shown good results with ethanol–water mixtures, normally at volume ratios close to unit. This article describes a study of the pulping of Pinus taeda wood chips and sugar cane bagasse, combining the use of ethanol–water mixtures and carbon dioxide at high pressures. Ethanol–water mixture was varied from 50 to 100% ethanol for sugar cane bagasse and from 30 to 100% ethanol for P. taeda wood chips, and the reaction times from 30 to 120 min and from 30 to 150 min for sugar cane bagasse and P. taeda wood chips, respectively. The effect of pressure and temperature on the yield and extent of delignification was studied, using a factorial experimental design, over the ranges 14.7–23.2MPa and 142–198 ◦C, respectively. The obtained results indicate important differences from the organosolv process, which may be due to the presence of carbon dioxide and/or the high pressure employed in this work. The pulp yields and extent of delignification showed, as expected, a much greater influence of temperature than of pressure. The best results were obtained at 16.0MPa and 190 ◦C. Under these conditions the pulping yield and the residual Klason lignin content from P. taeda wood chips were 43.7 and 4.9%, respectively, and from sugar cane bagasse 32.7 and 8.7%, respectively. These data correspond to a delignification extent in the order of 93.1% for P. taeda wood chips and 88.4% for sugar cane bagasse. Higher pressures lead to similar pulp yields but higher residual lignin contents. A series of tetradentate pyridyl-imine terminated Schiff-base ligands has been investigated for their ability in the catalytic oxidation of alcohols when combined with copper bromide (CuBr2) and 2,2,6,6-tetramethylpiperidyl-1-oxy (TEMPO). Analogous bidentate ligands showed poorer catalytic activity and the ratio of Cu:ligand was of crucial importance in maintaining high yields. The polydimethylsiloxane (PDMS) derived pyridyl-imine terminated ligand combined with copper(II) ions affords an effective and selective catalyst for aerobic oxidations of primary and secondary alcohols under aqueous conditions. Preliminary mechanistic studies suggest that bimetallic complexes may be playing a role in the catalytic transformation. Production of cleaner fuels from increasingly low-grade feedstocks and non-edible biomass sources. From the point of view of Green Chemistry, polymer-based catalysts are very environmentally friendly. These catalysts can be used and recycled in green solvents such as liquid polymers and supercritical carbon dioxide. They can also be very selective. In our recent studies, a series of α-w pyridyl-imine terminated polydimethylsiloxane ligands have been synthesized and characterized. It is interesting that these carbon dioxide miscible ligands form metallocyclic complexes when coordinated with copper(I) salt. Meanwhile, they provide perfect binding sites for copper (II) ions which then work as catalysts for more efficient aerobic oxidations of primary and secondary alcohols. A group of 14 different bio-sourced, renewable feedstocks (homoserine, 1; glutamic acid, 2; aspartic acid, 3; 2,5-furandicarboxylic acid, 4; fumaric acid, 5; oxalacetic acid, 6; tartaric acid, 7; malic acid, 8; succinic acid, 9; levulinic acid, 10; g-hydroxybutyrolactone, 11; xylitol, 12; mannitol, 13; sorbitol, 14) have been examined for their solubility/miscibility in a variety of ‘green’ solvents, including water, supercritical carbon dioxide (scCO2), and ionic liquids. Two other bio-based compounds 5-hydroxymethylfurfural, 15, and D-xylose, 16, were studied in selected solvents. Trends in solubility have been assessed so that these data may be extrapolated to help predict solubilities of other related compounds. For example, 10, 11 and 15 all demonstrated appreciable solubility in scCO2, as they possess weak intermolecular interactions. The dicarboxylic acids studied (4–9) all proved soluble in modified scCO2 (by use of MeOH as a cosolvent). While the polyols (12–14) and 1 were insoluble in scCO2 but water of various pHs and ionic liquids proved adept at their dissolution. Some of the amino acids studied (2 and 3) were only soluble in water with an adjustment of pH. This study investigated the potential of Northern shrimp (Pandelus borealis Kreyer) by-products as a source of omega-3 polyunsaturated fatty acids (x-3 PUFAs). The by-products (heads, shell and tail) of processing accounted for approximately 50–60% of the catch. Supercritical CO2 extraction (SFE) of the by-products at 35 MPa and 40 C generated a deep red oil, rich in x-3 PUFAs, specifically 7.8 ± 0.06% eicosapentaenoic acid (EPA) and 8.0 ± 0.07 % docosahexaenoic acid (DHA). Mitragyna speciosa is a narcotic plant but with specific medicinal importance. The main components of the leaves of M. speciosa are indole alkaloids. Previous scientific researches have shown that the alkaloidal extracts possess very potent anti-inflammatory, analgesic and opioid properties. The three most abundant indoles are mitragynine, paynanthine and speciogynine, the first two of which appear to be unique to this species. All these compounds were obtained from classical organic solvent (ethyl acetate, dichloromethane or methanol) extraction. CO2 extract of M. speciosa has never been studied yet. Hence, in this present investigation, supercritical fluid extraction (SFE) of M. speciosa was performed. Comparison of the TLC of SFE extracts with that of the ethyl acetate extract from this preliminary study shows no alkaloid was extracted out with 100% CO2. Alkaloids were only extracted with eluent system using ethanol as co-solvent and the optimal conditions was CO2-ethanol (80% EtOH), 40 °C and 5000psi. CO2 was chosen as the media of extraction because it is non-toxic and environmentally safe to prepare and use. Accurate knowledge of the phase equilibria of CO2-expanded hydroformylation reaction mixtures is essential to rational process design and development. Vapor-liquid equilibria of the following systems were measured in a variable-volume view cell at temperatures ranging from (313.15 to 353.15) K and pressures up to 9 MPa: CO + 1-octene, CO2 + 1-octene, CO + 1-octene + CO2, CO + nonanal, CO2 + nonanal, CO + nonanal + CO2, H2 + 1-octene, H2 + 1-octene + CO2, H2 + nonanal, and H2 + nonanal + CO2. The measured solubilities of CO and H2 in the liquid phases were consistent with literature values. The presence of CO2 was found to enhance the solubilities of both CO and H2 in the liquid phase. The enhancement factor is up to 1.54 for carbon monoxide and 1.82 for hydrogen. The Peng-Robinson equation of state (PR EoS) with van der Waals mixing rules and binary interaction parameters modeled the VLE data adequately, with much better fits for the 1-octene systems compared to the more polar nonanal systems. A group of 14 different bio-sourced, renewable feedstocks have been examined for their solubility/miscibility in a variety of ‘green’ solvents, and trends in solubility have been assessed so that the data may be extrapolated to help predict solubilities of other related compounds. This information could provide valuable insight into the workability of a host of new, green reactions using these compounds, opening the door to a realm of more environmentally friendly syntheses. The ability to sensitively detect and analyze large molecules and their reaction products is important for the analysis of biological materials, including medical samples, plants and foods. Such analyses present special challenges in terms of the need to selectively extract the compound or class of compounds in order to separate them from the complex mixture found in biological samples. In addition, conventional techniques for separating and identifying relatively small molecules are not applicable to high molecular weight materials where the volatility is low and they are often viscous liquids or solids at room temperature. The use of methyl acetate instead of methanol for supercritical synthesis of glycerol-free biodiesel from vegetable oils is a new process and its study is very limited in the literature. In this work, it has been tested for the first time on three edible and non-edible oils with different fatty acid composition. The process was also applied to waste oil with higher free fatty acid (FFA) content. The results demonstrate that the oil composition does not significantly influence the biodiesel yield. The influence of temperature, pressure and molar ratio of reactants was studied. All the oils achieved complete conversion after 50 min at 345 C, 20 MPa with methyl acetate:oil molar ratio equal to 42:1. The obtained data also allowed calculating the apparent rate coefficients and activation energies. Eventually, some new information on the process was obtained. Thermal degradation of triacetin, which substitutes glycerol as the by-product of the transesterification reaction, was observed. Some indicative experiments were performed to understand the role of the acetic acid produced by FFA esterification. Aqueous extraction using subcritical water is an environmentally friendly alternative to extracting oil and protein from oilseeds with flammable organic solvents. The effects of solids-to-liquid ratio (1:3.3–1:11.7), temperature (66–234 _C), and extraction time (13–47 min) were evaluated on the extraction of oil and protein from soybean flakes and from extruded soybeans flakes with subcritical water. A central composite design (23) with three center points and six axial points was used. Subcritical water extractions were carried out in a 1-L high-pressure batch reactor with constant stirring (300 rpm) at 0.03–3.86 MPa. In general, oil extraction was greater for extruded soybean flakes than with soybean flakes. More complete oil extraction for extruded soybean flakes was achieved at around 150 _C and extraction was not affected by solids-to-liquid ratios over the range tested, while oil extraction from soybean flakes was more complete at 66 _C and low solids-toliquid ratio (1:11.7). Protein extraction yields from flakes were generally greater than from extruded flakes. Protein extraction yields from extruded flakes increased as temperature increased and solids-to-liquid ratio decreased, while greater protein extraction yields from soybean flakes were achieved when using low temperatures and low solidsto- liquid ratio. To increase cotton’s consumption by inventing products and processes that demonstrate preferred use of cotton over competing fibers in needed and emerging applications involving plastics, textiles, and composites. To advance the realization of algae as a feedstock for biodiesel, process technologies and closed-loop biomass use must be optimized. Life-cycle analysis (LCA) of the biodiesel production process highlights the potential significant impact of improvements in the extraction of algal lipids and conversion into biodiesel. Further, a single-step lipid extraction and transesterification process was shown to have the highest energy rewards. This work investigates the potential for using scCO2 for the extraction and conversion process. scCO2 is shown to be an effective and selective solvent for extracting triglycerides from algal biomass. This work also explores the fundamental science necessary to achieve a one-pot approach that both extracts and transesterifies lipid from algae using supercritical carbon dioxide/methanol (scCO2/MeOH) and heterogeneous catalysts. A variety of basic and acidic heterogeneous catalysts have been surveyed for their effectiveness at transesterification of triglyceride (TG) to fatty acid methyl esters (FAME). Further the enhanced solubility of FAME over reaction intermediates, TG, and glycerol, is likely to provide a driving force for reaction. This research offers the foundations for a simple one-pot system wherein biodiesel can be directly, selectively, and sustainably produced from algae for further application in an algae biorefinery. The first phase of this project evaluated the reaction pathways for biomass feedstock in the presence of various cosolvents including acetone, methanol, CO2, and water using a 1 liter (di: 7.6cm, l: 23.1cm) high pressure batch reactor. Additionally, the effect of temperature on the extent of the reaction was assessed at 200 to 350 oC. In both instances biomass conversion rates compared to the starting material ranged from 70 to 90 %, with the remaining portion being the unreacted fraction and lignin. The resulting products consisted of complex chemical fractions: organic acids, organic ester derivatives, sugars, sugar-alcohols, thermal degradation products and more. Although the impact of using various cosolvents was noticeable at lower temperatures, at higher temperatures the extent thermal degradation products increased due to longer heating times to reach the target temperature (2 to 8 hrs.). Despite the challenges with longer residence time when using the batch reactor, results from this study gave an important understanding of the reaction behavior and interaction of the solvent and biomass. To have better control of the reaction extent at pilot scale, a flow reactor was assembled. The system consisted of a 250 ml/min slurry pump with reactor chamber that is 212 cm longer by 3 cm diameter, a maximum system working pressure up to 69 Mpa, electrical heating jackets and a condenser. Biomass slurry of 5 to 10% was fed into the reactor at varying temperatures from 200 to 350 oC and at residence times of 5 to 30 minutes. Analysis results from the flow reactor study will be main focus for this discussion. Chia (Salvia Hispanic, L.) is a crop that was used as food, medicine and paints by the Aztec Indians in Mexico before 1492, andnowhas a promissory future in several countries. Chia seeds oil is rich in polyunsaturated fatty acids, particularly omega-3 linolenic acid (54–67%) and omega-6 linoleic acid (12–21%) which pose great benefits for human and animal health. The oil extraction from Chia seeds using supercritical CO2 seems to be a good alternative because it operates at low temperature with good mass-transfer rates and with no solvent residual in the final product. The objective of this work is to evaluate the extraction yield of oil from chia seeds and the concentration of omega-3 and omega-6 acids using supercritical extraction with CO2 at three pressures: 136, 272, and 408 bar, and three temperatures: 40, 60, and 80◦C. Thevetia peruviana is an always green tree that grows well at adverse conditions and it is well adapted to Yucatan weather. Its kernal contains more than 60% of oil. Because the toxicity of the plat the oil is non edible and then a good candidate for biofuel production. In this study it is reported the results of supercritical extraction of oil from Thevetia peruviana kernals. The yield obtained 70% is higher than that obtained using solvent extraction 62% with petroleum ether, 60% with n-hexane, and to 40% using mechanical extraction. Looking for a good raw material for biodiesel at the Mexican-Yucatan peninsula, the study present data on the extraction of oil from Moringa oleifera kernals. Solvent extraction with n-hexane and ethanol, and supercritical extraction with CO2 are presented and compared with reported data. For supercritical extraction pressures of 200 to 400 bar and temperatures of 40 and 60⁰C were tested. Analysis with Gas Chromatography reveals that the main fatty acids are Oleic acid (69%), Palmitic acid (10%), and stearic acid (8%). Carbon Dioxide (CO2) extraction of cannabis is becoming more prevalent as the extract market grows with the spread of medical and recreational legalization. However, due to the historically underground nature of working with the substance, little true scientific experimentation and process development has occurred; even less has been published. Those new to the field have limited guidance. The following is a compilation of the process learnings regarding feedstock selection and preparation that Supercritical Fluid Technologies (SFT) customers’ companies currently working in the CO2 cannabis extraction field, have shared with us. Due to the proprietary nature of each company’s specific process, the material here will be presented in a generic way that is applicable to the majority of processors. separation, purification, recovery, and analysis of some rare earth elements from various oxide mixtures. The following is a compilation of the process learnings regarding selection of extraction parameters that Supercritical Fluid Technologies (SFT) customers’ companies who are currently working in the CO2 cannabis extraction field have shared with us. Due to the proprietary nature of each company’s specific process, the material here will be presented in a generic way that is applicable to the majority of processors. All Cannabis feedstock contains water, even that which is properly dried and cured. Removing this water from the extract after processing raises the cannabinoid concentration of the extract, prevents it from spattering when consumed directly though vaping or in a rig, presents a cleaner taste to the consumer, and enables a more attractive appearance. CO2 processing creates extract that will be laden with dry ice. Depending on the equipment and processing conditions the extract will need to be de-gassed and/or heated prior to dewatering. achieved at 45 MPa, 65 °C, 5.4 g water to 3.2 g berry pulp paste, 15 min static and 20 min dynamic time. Different combinations of water and ethanol as co-solvent did not significantly affect the TA yield. Furthermore, similar anthocyanin extraction yields were obtained in the case of the pulp paste and rehydrated freeze-dried berry pulp powder, which indicates that freeze drying pretreatment is not required prior to scCO2 extraction. Compared with conventional extraction, the use of scCO2 and water as co-solvent offered higher anthocyanin extraction efficiency (52.7% versus 38.3%) with improved antioxidant activity (89.8% versus 72.2%).